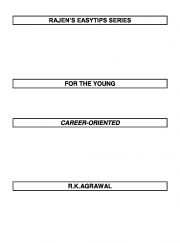 Description of "RAJEN'S EASYTIPS FOR THE CAREER-ORIENTED (eBook)"
An easy-to-browse ready reckoner for today's youth, with lots of easy tips for career-boosting. R.K.Agrawal hopes his young readers will feel enriched with the easy tips and ideas being shared in this book. Reviews of "RAJEN'S EASYTIPS FOR THE CAREER-ORIENTED (eBook)"